I just got back from Spring Break in Italy where I was inspired to restock my kitchen in Tunis with some specialty supplies. First of all, the table at the agritourismo we stayed at had a bottle of chili oil every night and we got addicted to it, wanting to pour a little on everything. I bought the hottest chilies I could find at my market when I got home and got my own bottle started steeping. This is such a simple thing that I had completely forgotten about making. 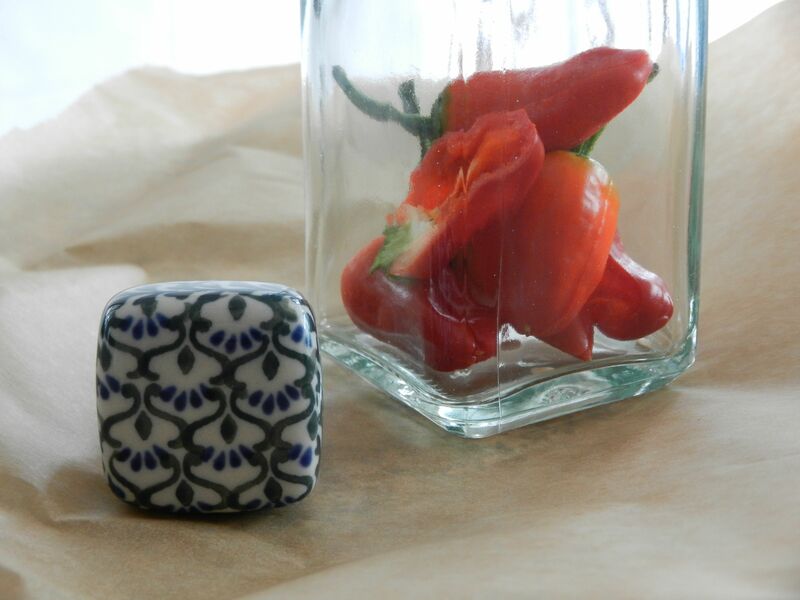 My friend, Lauren, just gave me this pretty Polish pottery stopper for my birthday so I made up a lovely bottle in minutes. I wanted to keep most of those cute chilies whole so I just made slits in the ends so the oil could come into contact with the chili flesh and seeds. 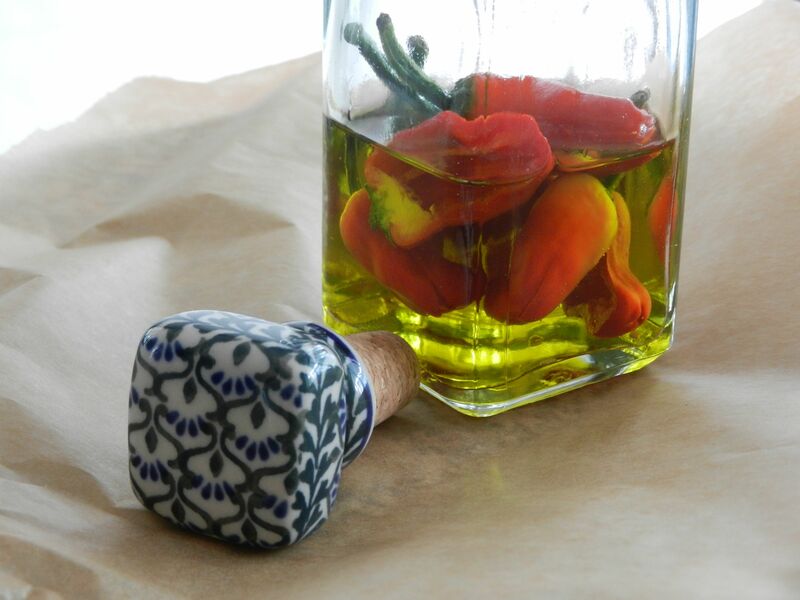 I filled the bottle to the top with our grassy, green olive oil. 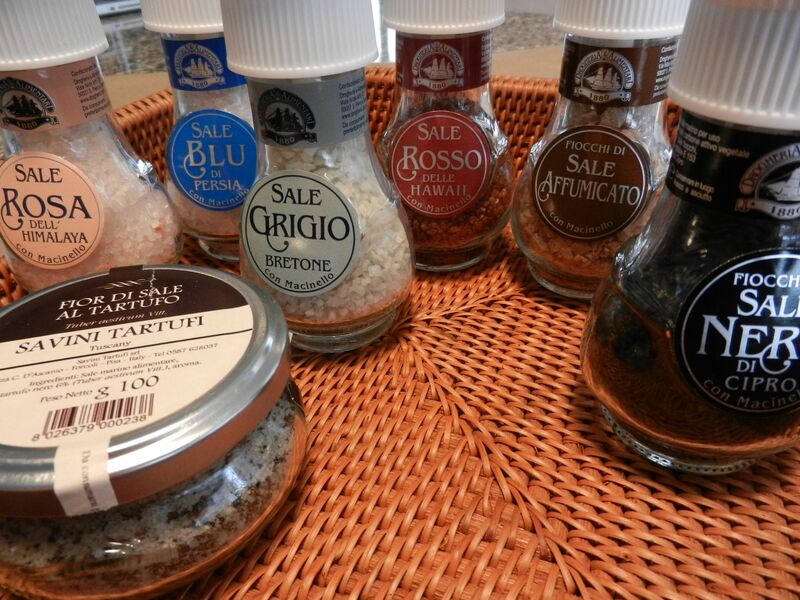 Then, the PAM grocery store, outside Siena, had a tremendous selection of specialty salts. I have about every salt I need now to cook through Mark Bitterman’s book, Salted, cover to cover. 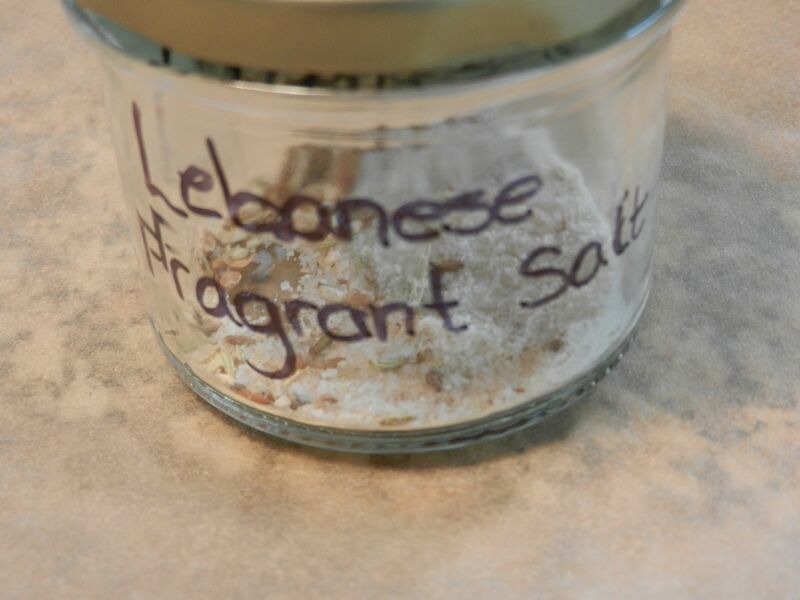 I made up another salt mixture, based on a recipe from Saha, A Chef’s Journey Through Lebanon and Syria, by Greg and Lucy Malouf. This is easy to put together and keeps for 6 months. It is a nice quick cure for a piece of fish. 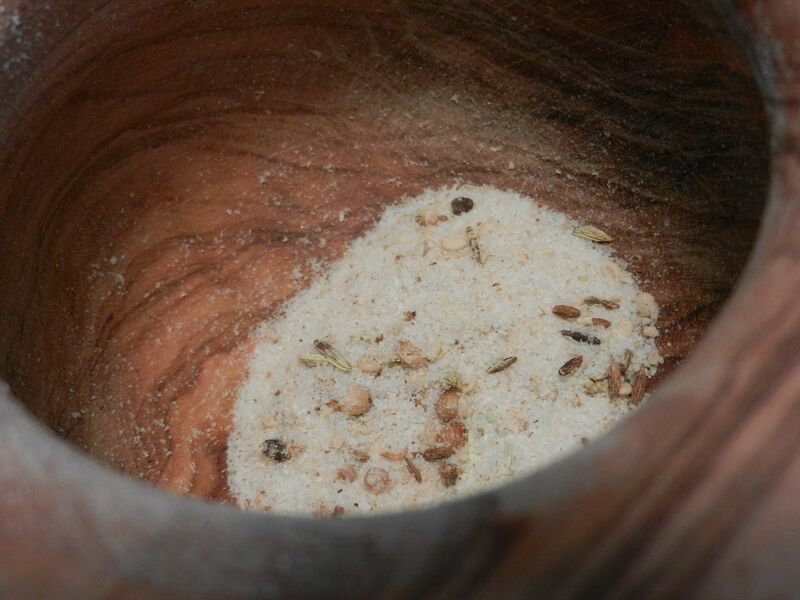 Put the ground spices, toasted sesame seeds and salt in a skillet and gently warm through so they merge into one fragrant powder. Store in an airtight jar. 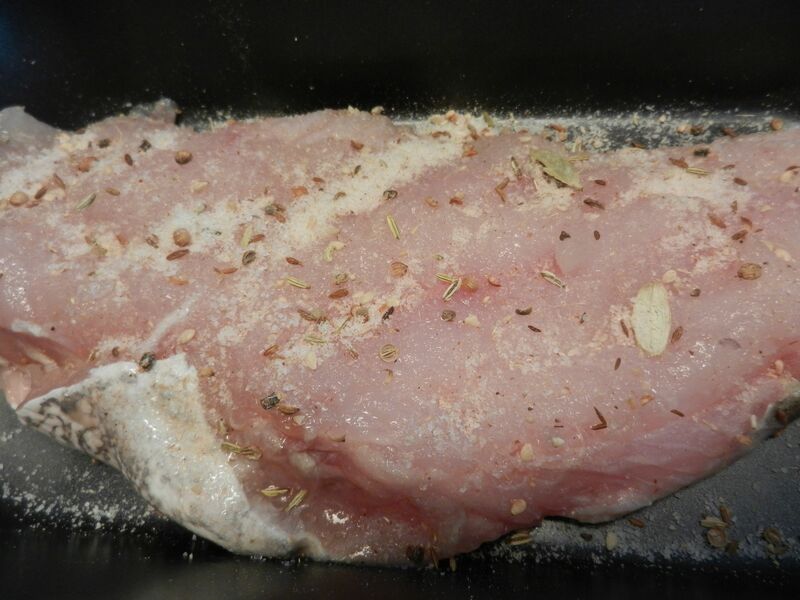 Dust the fish all over with the Fragrant Salt and refrigerate for an hour to lightly “cure”. Before cooking, rinse the fish and dry it thoroughly. In a deep cast iron skillet or fish poacher, put a layer of sliced onions. Place the fish on top, skin side up. Pour in enough olive oil to barely cover onions and fish. 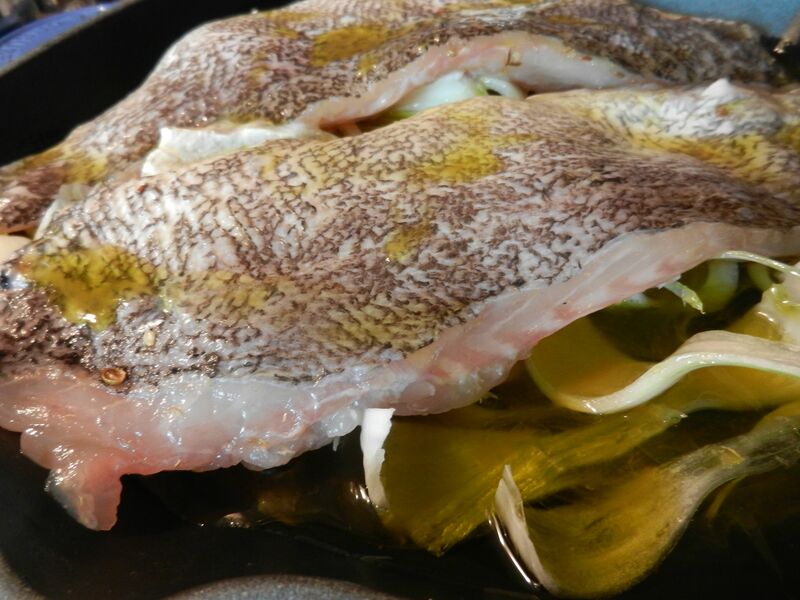 Put the pan on the stove and heat gently to 140 degree F. Cook for 8 minutes then remove from the heat and let the fish sit in the oil for another 2 minutes. You can easily skin the fish at this point, if desired. Carefully lift the fish out of the oil and place it on paper towels to drain. 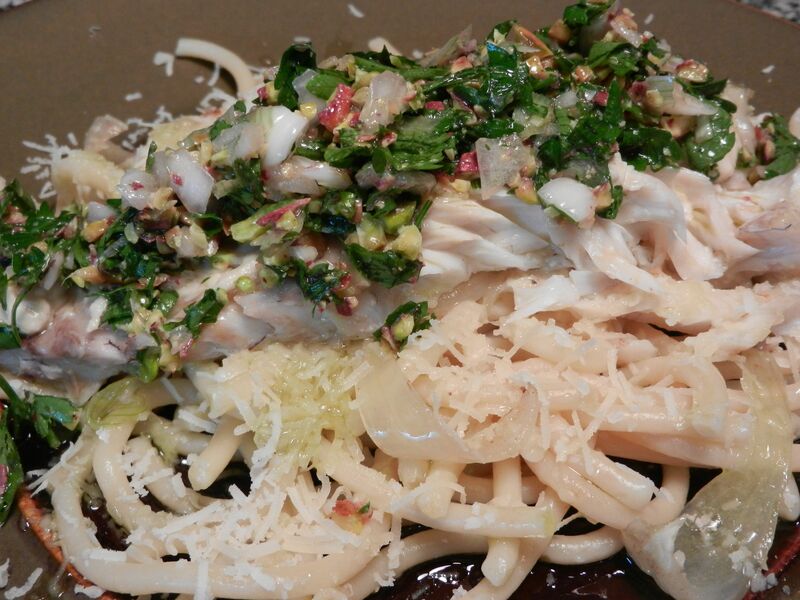 Mix all ingredients and pack onto the top of the poached fish before serving. I am glad you had such a restful and inspiring trip. My favorite use for chili oil these days is to use it to pop my popcorn. Then I sprinkle some parm on top and yum! Oh Kristi, that sounds so good. Popcorn is another thing I’ve forgotten about making. This is what happens when you don’t have your kids at home anymore. Thanks for bringing it to mind.